Is a Second Generation Restaurant A Turn-Key Opportunity or a Prelude to Failure? Recently, our firm has become inundated with requests from clients to find "turn-key" restaurant sites. Whether it is a significant uptick in consumer confidence levels or a general increase in regional demand, everyone seems to want to open a new restaurant in Southern Florida – With one major caveat – everyone wants to find a former restaurant that converts quickly to a new concept. In real estate jargon, we call this a "second generation restaurant," meaning that the designated location will not be housing a restaurant for the first time. A landlord willing to provide a fully functional or semi-functional commercial kitchen at no additional cost? Wow – what a deal, right? Remember, everything has a cost. 2) Clients don’t conduct proper due diligence. When viewing a second generation restaurant, clients often don’t see past the tremendous savings in not having to purchase new equipment or go through lengthy rezoning procedures. However, it is often that extra large hood or triple walk-in freezer that drowns out the client’s ability to assess more important attributes of the property. Clients must ask themselves, "Is this the location I want for my new restaurant, or am I just acquiring this property because it comes with free equipment?" 3) Free doesn’t always mean free. Yes, that six burner stove looks nice, but does it work well or will it fail during your busiest hour? Assuming the former restaurant didn’t have the capital to continue operations, why would any valuable equipment be left behind. With equipment auctions commonly occurring throughout the country and dozens of online forums set up for the sole purpose of selling equipment, why would a fledgling business leave behind a valuable piece of equipment? Yes, sometimes the landlords prevent removal of FFE, but if the previous tenant is not paying rent, why would they choose to abide by this restriction? 4) Everything goes out the window. Many new restauranteurs have visions of a creative new concept, some charming new decor, or an enhanced customer experience. Often, these innovative ideas get tossed aside because the full concept cannot be jammed into the existing restaurant space. Do you ever see a McDonald’s move into a former Pizza Hut building? No. McDonald’s would demolish the old Pizza Hut and rebuild from scratch. Successful restaurants understand models and concepts that work and are not deterred from that vision by the allure of some upfront cost savings. 5) Learn from others. Don’t believe us? Just think about a property in your neighborhood that has been home to half a dozen restaurants over the past decade. Every neighborhood has these buildings it is rare that these high-turnover properties yield successful restaurants. The buildings house multiple culinary concepts until one day some landlord or some investor or some restauranteur does the right thing and starts from scratch. If a restauranteur truly commits to a successful long-term operation, he or she should not change track because of some free equipment or the prospect of opening for business one or two months earlier. Any prospective restaurateur (or business owner for that matter) should conduct thorough due diligence before any venture. Establish a business model and execute a plan. Work with the best professionals in the field. Allocate more capital than anticipated and don’t stretch too thin. Too many restaurants have failed because owners neglect business basics and gravitate to an easier or cheaper turn-key solution. That said, we would love to be proven wrong. There are plenty of second-generation restaurants available throughout Southern Florida. 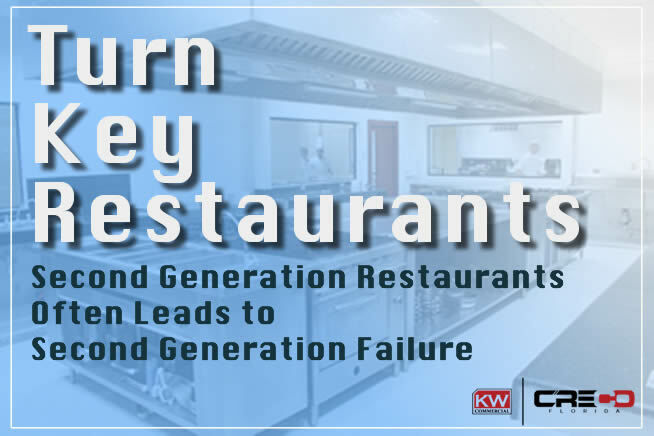 Contact a KW Commercial professional today if you’re interested in opening a new restaurant, but please heed caution if you’re considering a second generation restaurant location and keep an open mind in considering the best location for your new restaurant.